Ok so, I know not a whole lot of people "get" Grindhouse so I'll explain it as best I can. In the late 1960's and all through the 1970's the old movie palaces of the 30's and 40's weren't being taken care of since they could only house one or two films at once, and Multiplexes were on the rise. The areas of town that these movie houses were located were getting pretty run-down too, with city growth and such. So independent films would be shown here in double and sometimes triple features. The independent film distributors would "grind" out these films at a fast rate earning the theaters that showed the films the title "Grindhouse" grindhouse cinema didn't have the big budgets or big stars that the mainstream Hollywood films had, so they had to rely on entertainment value or shock value to plant butts in seats. They would have "exploitable" elements, a feminist message, extreme violence, a civil rights message, something that the filmmakers could exploit to get people to buy tickets. This earned the films the title of "exploitation films". However, there would only be several prints of the films made, and they would just travel the country, often losing frames to projector boys that kept collections, and gathering dust on the reels badly damaging and scratching the look of the film. This brings us to Grindhouse. Directors Robert Rodriguez and Quentin Tarantino (both icons of modern American filmmaking) grew up with these Grindhouse double and triple features and came up with the idea to do one themselves while watching old exploitation films at Tarantino's house one night. Thus creating Grindhouse. Grindhouse was an ambitious undertaking of two films with fake trailers for other exploitation films in between the two features. Both filmmakers also "aged" their reels giving them a grainy "just traveled from New York to the west coast and everywhere in between" look. Low budget is the name of the game with Grindhouse and that's what you get the whole way through. First a fake preview for "Machete" a film about a mexican hitman played by the great actor Danny Trejo, hired to kill a senator that's against illegal immigration. MAN I want to see this made into a film! Next up is Rodriguez's half of the event "Planet Terror" the story follows a group of people blasting zombies in an infested area of Austin, TX. WOW what a ride! This was one fun movie to watch! It had the low-budget look but the big time action! And I gotta say Rose McGowan turned in a great performance as the machine gun legged go-go dancer Cherry Darling. That leg was too cool NOT to buy a ticket for! She also delivers my favorite line of the entire experience. Ok zombies dead, time for some low-budge trailers! First up Werewolf Women Of The SS Rob Zombie directed this and it's about the Nazis turning women into Werewolves to fight in the army. It looked INCREDIBLY lame but Nicolas Cage as Fu Man Chu cracked me up so hard! Then there was Edgar Wright's (Shaun Of The Dead) offering for a bizarre haunted house flick called "Don't" "If you're thinking about opening that door...DON'T If you're thinking about seeing this film alone...DON'T...DON'T" HAHA! this looked like it'd just be weird if actually turned into a film, but the super cheesy "DON'T" dialogue made this preview HILARIOUS. Next was a random (or so i thought until Death Proof) ad for a fake Mexican restaurant called "Acuna Bros." food looked good but the ad felt like filler. The final fake preview was by director Eli Roth of Hostel fame. He came up with a ridiculously twisted trailer for "Thanksgiving" a slasher flick set in Plymouth, Massachusetts on well..Thanksgiving Day. While this looks like the only film besides Machete that could stand alone as its own movie you can count me out. Hostel was dumb enough. So after 3 fake film trailers we're taken back to Austin to witness "everyman" serial killer Stuntman Mike wreak havoc on the local ladies. Or so I thought. I WAS BORED TO TEARS during this movie!! It was nothing but women talking, and talking, and talking, and talking, and doing MORE TALKING! That's all they did was talk! Until the last half hour when a SUPER long but SUPER awesome car chase began between Stuntman Mike and 3 of his female victims. Despite all the heavy dialogue the end MORE than made up for it. I don't think Tarantino could've ended this better! I just wish I could've seen more of Stuntman Mike played awesomely by Kurt Russell, I've never NOT liked this guy. So if you've got 3hrs. and 5min. to kill and want a quick crash course in film history, and one of the most creative ideas to come out of Hollywood in the last decade. Take a trip to the Grindhouse. It'll Tear You In Two! Alright, so i went into this movie expecting the best and left a bit traumatized. 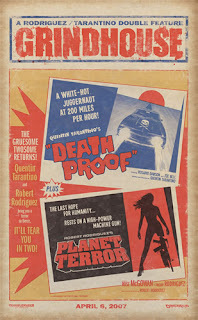 Haha, so Planet Terror grossed me out beyond belief and i was still so shocked from it, it was hard to judge Death Proof on it's own.